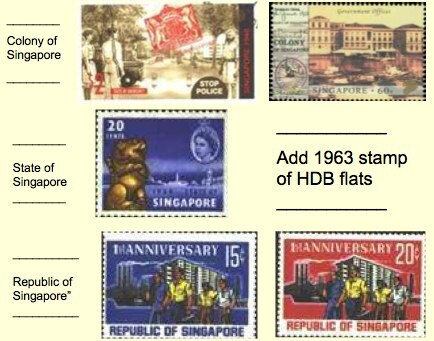 Recently, a colleague asked whether there are any stamps that show Singapore as a British Colony, as the self-overning State of Singapore, and as the independent Republic of Singapore. The answer is Yes, Yes and Yes. The date is not shown but we know that Singapore gained independence on 9 August 1965. Thus, stamps with ‘First Anniversary’ would have been issued in 1966. Why are there no stamps of Independence Day, 9 August 1965? One Monday evening I went to Yio Chu Kang Swimming Pool for a night swim. To use the ticket-dispensing machine you have to press the category you want. Being a senior Senior Citizen of 63 years of age (you only have to be 55 years old to qualify for this category), I needed to pay only 50 cents for my swim ticket instead of $1.00 . On this particular occasion, I pressed the ‘Senior Citizen‘ slot and put in my 50-cent coin. To my surprise, the coin rolled out. When I looked at the ‘Senior Citizen’ slot again, I noticed there was a big red cross on it. This indicated that the machinehad exhausted its store of ‘Senior Citizen’ tickets. I duly informed the lady clerk at the counter desk, intending topay her and get a receipt but she said, “Old Uncle, please go back to the ticketing machine and press the‘Child’ slot ”. I told her that I couldn’t honestly do that as I was no more a child by a long shot . So, being the obedient overgrown child that I am, I pressed and obtained the ‘Child’ ticket and carried on with my swim. Somehow, it seemed a bit easier to swim the pool laps that evening. Mr Lee KuanYew, the Prime Minister of Singapore from 1959 to 1990, celebrated his 80th birthday on 16 September 2003. Some people asked me whether there is a stamp featuring him. The answer: There is no stamp featuring him. However, there is a stamp showing him in the background. Somewhere in my previous retrievia I mentioned a sermon where the pastor told the story about the woman who had committed adultery. Under the law of that time this woman would be condemned to death by stoning. The story goes that this woman was brought before Jesus and He was asked what action should be taken. Jesus simply looked down at the ground and said, “He who is without sin, may cast the first stone”. One by one, the crowd left. When Jesus looked up and saw no one, He asked the woman, “Where are they, who have condemned you”? The woman answered, “They did not condemn me”. And Jesus said, “Neither do I condemn you. Go. And leave your life of sin”. At that point in the sermon, I suddenly looked up and asked my wife who was seated next to me. ”You know what I heard the pastor saying; it seemed like “Go. And live your life of sin”! What my ears told me didn’t square with what my brain told me! It is a reminder to pronounce ‘leave’ and ‘live’ differently and clearly. With all the news about religious harmony, some of us might think this is a recent topic of interest. 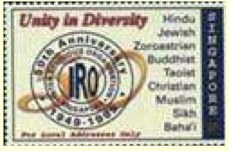 As far back as 1949, the first Inter-Religious Harmony group was formed. On its 50th anniversary, a set of special stamps was issued. Here is one of the stamps. left to right, church, Chinese temple, mosque and Indian temple. Talking about the Concorde and aviation reminds me that this year 2003 marks the centenary of the first engine-powered flight by the Wright brothers. 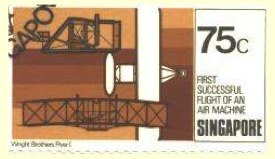 Here is a Singapore stamp that commemorates the event. The Wright brothers, Orville and Wilbur, were reputed to be men of few words. The story goes that in a big celebration dinner in honourof their pioneering achievement, the Master of Ceremonies said, “I now call upon Orville Wright to say a few words”. Rising slowly from his seat, to long and loud applause, Orville Wright said, “Thank you for the privilege to say a few words. Actually, it is my brother Wilbur who will say a few words”, and sat down. It was now Wilbur’s turn. Rising slowly from his seat, to long and loud applause, Wilbur Wright said, “Thank you for the privilege to say a few words. My brother Orville has already said them”, and sat down.